The University of Florida is a public university established in 1853. Its total undergraduate enrollment is 34,500. According to US News and World Report, it is ranked as the #42 national university. The university is based in Gainesville FL. It features an online MBA program through the Warrington College of Business that is ranked #6 by US News and World Report. This program is well known for its quality and flexibility; there are both live and recorded classes, and students have the opportunity to experience global immersions. Admissions selectivity: It is ranked the #5 most selective online MBA in the US News survey. This indicates the program is of higher quality, as more selective programs usually have better quality students and professors. It also is ranked 84 points out of 100 for selectivity. Student engagement: It is ranked #31 and a total of 81 points out of 100. This indicates the professors are responsive to students online and that students are well satisfied with the quality of the instruction. Peer assessment score: This is a ranking from 1-5 that indicates how highly in esteem the program is held by competing programs. The 3.7 out of 5.0 score shows the program is relatively well regarded, especially in light of its reasonable cost. Faculty credentials and training score: This ranks how well trained the professors are to teach online. University of Florida gets a good score of 80 out of 100. The program also is well ranked by other publications: #1 by the Financial Times for in program delivery for 2017, and #2 in the same publication for online interaction in 2017. The Princeton Review also has ranked the online MBA program as the #5 program in its most recent review of US online MBA programs. The University of Florida offers several options for the MBA program. First is a fully online MBA program that can be completed full time in two years without any campus visits. Next is a 16 month, accelerated option for people who have a bachelor’s in business that they completed in the past seven years. The third option is a 27 month online and in person program that is made for those who have a business bachelor’s and have more than seven years of business experience. Program accreditation is always important for MBAs, but even more so for a fully online program. It is important for students and employers to know that the program is of the highest quality as determined by a respective accreditation body. The Association to Advance Collegiate Schools of Business or AACSB has accredited this online MBA program. Thus you can be confident it is a good quality program that will teach you the business management principles you need to be successful. 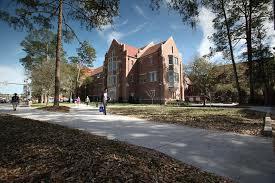 The MBA programs at the University of Florida, including the online MBA, require the student to take the GMAT or GRE. Some schools no longer require students to take standardized exams to be considered for admission. The University of Florida’s online MBA program is quite competitive, so they still use these tests as part of their admission criteria. The only way to get a waiver from GMAT or GRE testing requirements is to have a PhD, MD, JD, or a master’s degree from a US school and a previous test score.